Wondering how to tell real pearls from a fake ones? Nowadays, you can easily find various types and shapes of pearls on the market. And not all pearls are real pearls. There are a lot of vendors who claim that they are offering authentic pearls and instead they are selling you plastic beads. With the increased number of online pearl stores, no wonder you question yourself more than once whether the pearls you want to buy are real. Therefore, you need to know how to identify fake pearls and what to do if you get the feeling you’re getting tricked. We know how upsetting is to find out that you spent a lot of money on a product that is actually fake. You invest your time, money, hopes in something that you want to last forever and to create a beautiful memory. Pearls are considered a luxury item and many are tempted to buy them at more affordable prices. But imagine you want to offer a real pearl necklace to your loved one and you go to a jewelry store that sells impressively good-looking fake pearls. You don’t know this and you get tricked. And the person who receives it knows how to tell real pearls. What do you do in this case? Do you apologize and take it back? What if she does not want to hurt your feelings and says nothing about it? Don’t let yourself seduced the next time you intend to purchase pearls in a flea market or from sellers who claim to have authentic pearls. Take your time and investigate them discretely by following our steps! After all, you do want to take care of your money and you want to own a timeless piece of jewelry. Fake pearls or artificial pearls are made out of unnatural materials. The human intervention dictates the final result. Glass, plastic, ceramic, shell are various types of material sources that man uses in order to create imitation pearls. The bead is then coated with a varnish of fish skin to simulate that luster or iridescence. How artificial pearls are made? Technology and innovation have led manufactures to improve their creation processes. Therefore, there are various ways to make false pearls: waxed glass beads imitation, solid glass beads imitation, plastic beads coated imitation, imitation pearl beads, shell powder synthetic beads. How can you tell a real pearl from fake? 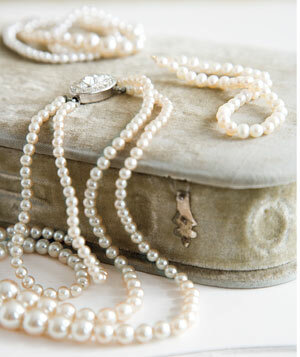 Here are nine easy, non-invasive and non-damaging ways that will help you check your pearls. 1. The first feature that helps us on how to tell real pearls from fake is their surface. Real pearls have like a finger print-like surface ridges in them, so they are not identical or perfectly spherical. If you look very closely at them even under a magnifying glass you will notice these surface ridges and the specific quality to each pearl, whereas fake pearls they all of them look identical and have smooth surfaces. As a result, this is a great and east way to tell the difference between imitation and real pearls. Basically, in the case of fake pearls, they all look the same. 2. The second step that will help you identify fake pearls is to look at the overtone color. All real pearls should have an overtone color that’s very lustrous, whereas fake pearls have a dull, milky sort of color. 3. The next tip on how to check pearls is that real pearls are reflective. So if you hold them into light, you should see a little reflection of the light in them. Fake pearls are dull, therefore they won’t be reflective like that. 4. The next tip on how to identify real pearls would be a slight difference in their size. If you look at a strand of real pearls, and check each individual pearls and you actually notice that each one of them has a slightly different size and shape and texture and that is because they occur in nature. Whereas a fake pearl would have the same size and shape. They would all look identical. 5. Further, if you want to check if your pearls are real, check the drill holes. Real pearls tend are generally drilled from both sides, to meet in order to meet in the center. Fake pearls tend to have larger or even straighter holes, which gives them a lower value. 6. A good way to tell whether the pearls are real of fake is what we like to call the body heat test. Real pearls are cold to the touch. Their temperatures are very interesting. When you haven t put them on yet, and you touch them, they feel cold. But when you put them on, they sort of warm to your body temperature, whereas fake pearls generally tend to remain at room temperature, so if you touch them they will feel about room temperature. 7. Another aspect to take into account when identifying real pearls is their weight. Real pearls are heavier than fake pearls. Fake pearls light. If you pick up a strand of them, they are going to feel really light, whereas real pearls are kind of heavy to your hand. 8. It may sound a bit strange, but using your teeth is a good tip on how to tell real pearls from fake. If you were to take a string of pearls and run them along your teeth, if they have a gritty feeling, then they would actually be real pearls. If they have a smooth feeling, they are certainly fake pearls. We only recommend doing this at home in case you want to check your own pearls and not inside a jewelry store or a public market. 9. Finally, there is the viscosity or the fluidity test. Genuine pearls are silky to touch, while the imitation pearls don’t feel smooth. They have a sticky feeling when rolling or sliding. Consequently, they won’t give you the nice sensation that only real pearls are able to. In conclusion, these are the easiest and quickest ways to find out if your pearls are fake or not. We are aware that in some cases you can’t always follow these steps, but hopefully, we gave you some useful tips. Try to spend more time checking your pearls and always make sure you’re buying them from a certified seller. Reviews are also helpful, so take some time to read them as well. On our website, you can find reviews under each pearl item. Explore our store and purchase your pearls without worries!